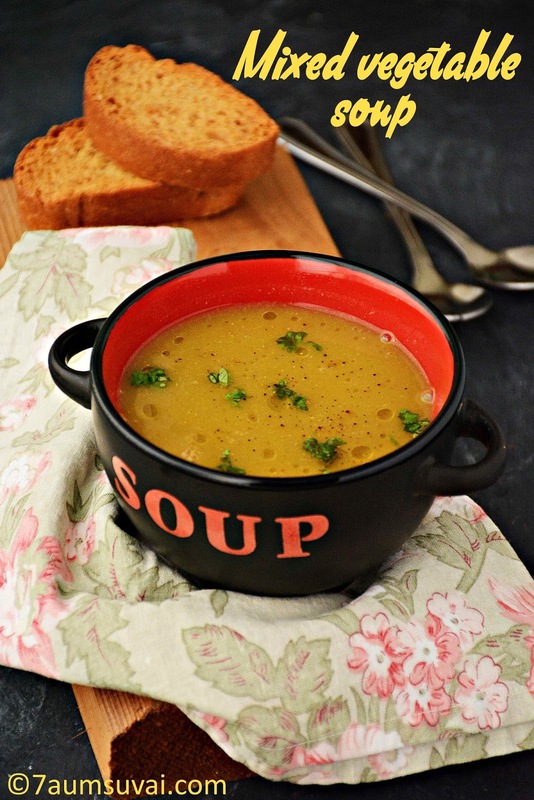 A healthy and tasty soup prepared with mixed vegetables and other spices. 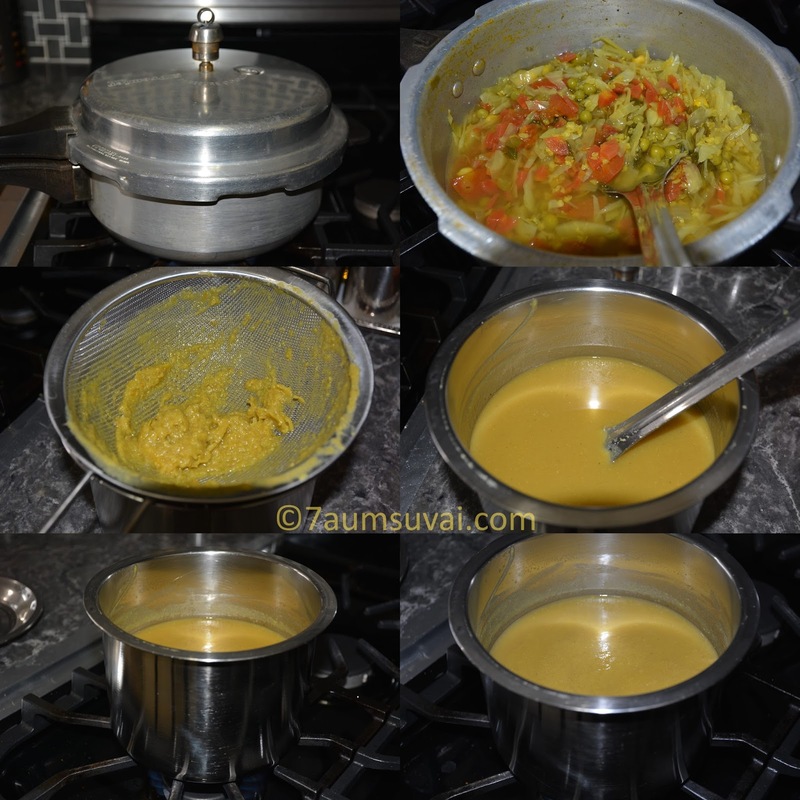 I learned this soup recipe from my mom during my recent visit to India. I used to prepare this soup for her almost every day as she had a medical condition which requires a specific diet to follow. 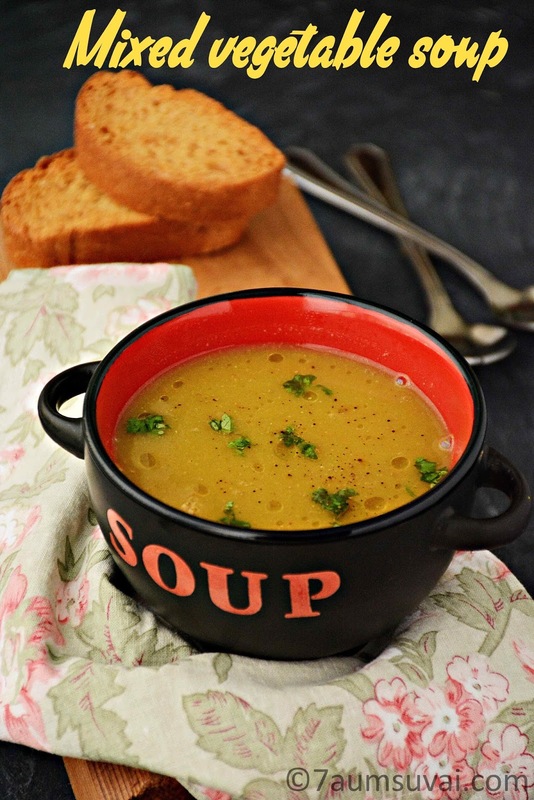 It is a really nutritious soup as it contains all the vegetables and healthy spices. People who suffer from anemia, diabetes and other medical conditions can drink this soup as a part of their daily diet. Also, people who live in the cold countries may prepare this healthy soup during the winter season, which helps them stay warm and cozy. Take a pressure cooker, add all the vegetables, along with chopped onion, tomato, garlic and coriander leaves. Followed by turmeric powder, pepper powder, curry leaves powder, Moringa leaves powder, jeera powder, asafoetida, and required salt. 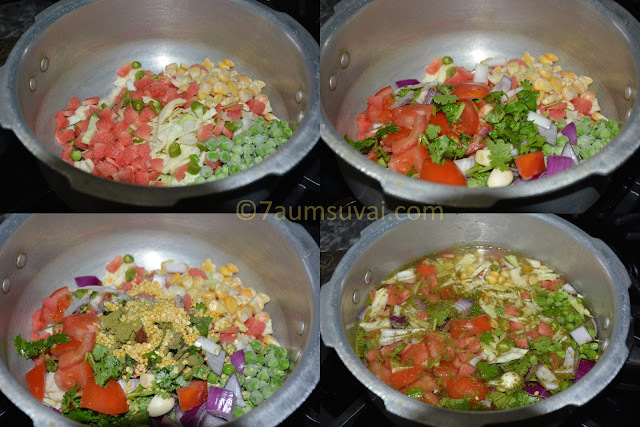 Add moong dal / paasi paruppu and add 3 to 4 cups of water or water above the vegetables is enough. Finally add sesame oil on top and pressure cook for about 3 whistles. Allow them to cool completely. Transfer the cooked vegetable mixture to a blender expect water(reserve it for later use). Blend it to a fine puree. Pour through a fine strainer to separate the pulp into the vessel with remaining water (reserved soup). Bring it to boil, check for salt and spice, if required add more pepper powder and salt at this stage. Mixed vegetable soup is ready to serve. You may use any vegetables of your choice like radish, nookkal, potato etc. You may increase or decrease the pepper powder as per your spice level. Moringa podi is completely optional but if you have any do not hesitate to use it. You may add fresh curry leaves instead of curry leaves powder. Do not add more water while cooking vegetables. Just add enough to make perfect consistency soup. 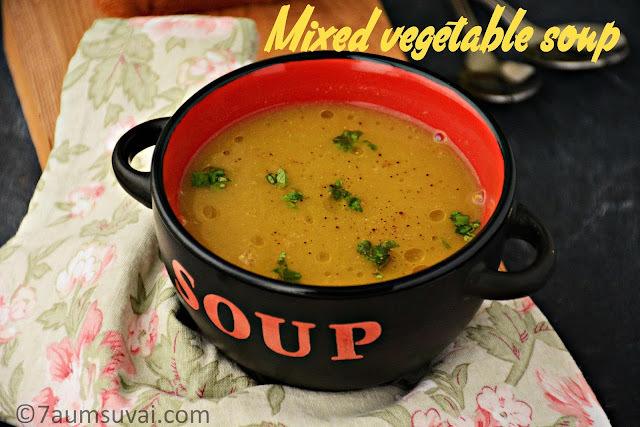 Technorati Tags: Mixed vegetable soup,vegetable soup,soup recipes,soup,Indian soup recipes,7aumsuvai,7aumsuvai recipes.,vegetables,Indian style soup,Indian style vegetable soup,tamilnadu,tamil recipes,Soup with moringa leaves,South Indian style vegetable soup,Vegetable soup without stock,vegetable stock,vegetarian,Vegetable soup with video. Thank you Angel. You will love it.. 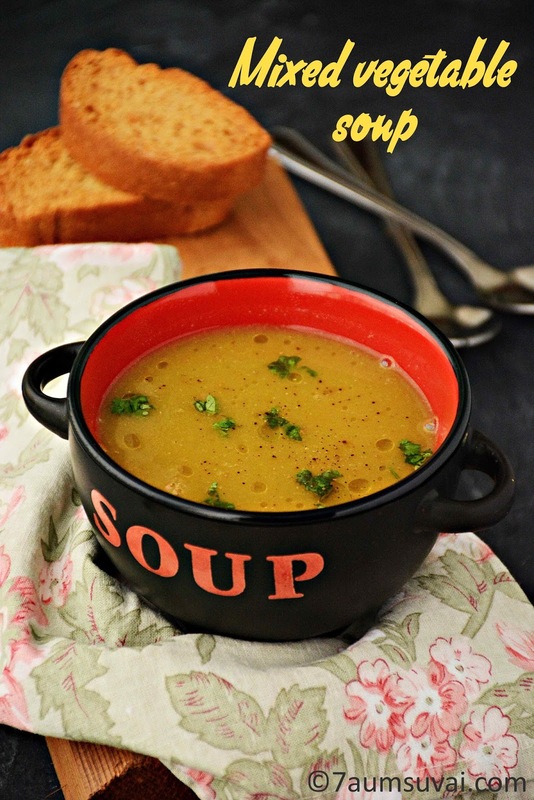 Delicious and tasty soup !